Work has continued on long term planning and the development of critical relationships with various levels of government, private donors and volunteers. In April 2014 a milestone of support was delivered in with an announcement of funding to provide further enhancement of the MacDonald Creek outlet and adjacent shoreline by the Pacific Salmon Commission and the Federal Dept of Fisheries and Oceans. This project will further enhance the recovery of the shoreline and habitats for salmonids, forage fish and seabirds not to mention for humans walking the alongshore pathway. The project delivery emphasis of the 2012-2013 Shoreline Protection Plan with the available $100,000 approved budget comprised pilot projects at Dundarave Pier (the Marr Creek Outlet) together with minor works at Lawson Park and along the seawall immediately west of Lawson Creek. Working within tidal and budgetary contraints, the Lawson Creek estuary and beach areas was tweaked to enhance features originally implemented in 2006. The original pilot works have been more than satisfactory over the past few years in moulding the shoreline with the sediment and energy supplied by natural processed. To recap, the estuary has become attractive to returning salmon populations, the beach against Lawson Pier has become wider, flatter and sandier for enjoyment by the public, protection to the aging pier while providing enhanced spawning conditions for key forage fish such as surf smelt. This has been verified by assessments done by high school students who have documented the spawning as part of a the school outreach programs. A log pedestrian bridge over the creek continues to enhance the shoreline pedestrian pathway. The soft gravel pathway along the upper shore from Lawson Park to 15th Ave has fulfilled the longstanding goal (as well as personal financial legacy) of past Mayor Don Lanskail, to provide a contiguous seafront walkway. The work done in 2013 reinforces and builds further upon the lessons learned. Throughout 2013 the District’s has placed renewed emphasis on communicating details of each Shoreline Protection Plan project with descriptive site signage which was well received by thousands of members of the public walking the seawalk. The construction access ramp created at the foot of 24th Street has been left in place to enable further opportunistic stockpiling and subsequent placements of “free” field boulders from construction excavation projects within the District. In particular, the support and collaboration of the British Properties provided large volumes of “field” boulders. The access ramp itself is itself now evolving into a small pocket beach. Marr Creek is an urbanized mountain to ocean stream that ignominously is squeezed through a culvert pipe at its moutth as it discharges through the concrete lock block seawall just east of the Dundarave Pier. The vertical face concrete seawall combined with the groin effects of the Dundarave Pier configuration has lead to substantial erosional losses of beach substrate over the years all the way down to Navvy Jack Point. While large volumes of beach replenishing sediment are provided naturally by Marr Creek these sediments have mostly been lost offshore to deeper water. The boulder garden and reef placements are intended to not only encourage retention of the intertidal areas but also to allow these beach materials to migrate down drift towards Navvy Jack Point rather than being deflected to offshore depths. Just as the modifications at MacDonald Creek and Lawson Creek have been visibly building beaches down drift to Ambleside since 2006, over the coming decades, this training and retention should encourage a stable and productive shoreline from Dundarave to Navvy Jack Point. An immediate side benefit of these works is also the visible retention of an enhanced sandy beach area immediately adjacent to the pier. This project also provides another working example engaging the natural shoreline processes and letting Nature do the most significant work over time. Just as the works at MacDonald Creek and Lawson Creeks have resulted in a much wider and flatter shoreline all the way down to the Ambleside Pier so should the work at Marr Creek induce similar long term down drift benefits. The Marr Creek discharge culvert itself is one of the most challenging of sites given the adjacent vertical concrete seawall. As this project demonstrates early success it will validate similar works along the shoreline that will, in time, benefit from the newly retained alongshore cobble/sand supply, including the premier project, that is… the task item to develop a substantial reef and tombolo feature at Navvy Jack Point to accumulate a wider and crenellated shoreline beach over the decades and centuries. To be effective in fostering development of a large intertidal tombolo and a long term accreting intertidal beach fronting the seawalk, the development of a Navvy Jack reef feature will require a significant volume of reef building material. 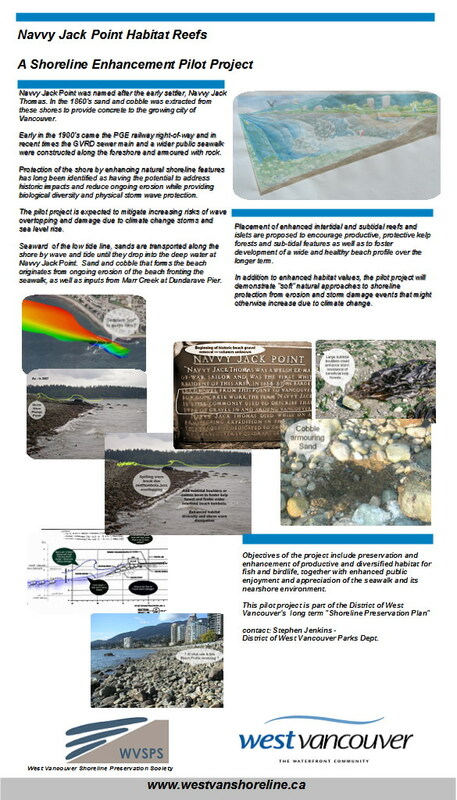 Now that the cobble and sands from Marr Creek are being retained and are more available to moving alongshore, the focus should be renewed on retaining an accreting intertidal shore over the coming decades to reverse erosional losses that might otherwise impact the seawalk and the underlying sewer main. . If initial successes continue to be realized, it should be possible, to not only reverse ongoing erosion, but to proactively adapt to the predicted impacts of sea level rise and increased storm events as well as providing a highly productive and potentially enjoyable walkable shoreline for future generations. West Vancouver continues to demonstrate a proactive working and learning example of municipal shoreline stewardship as a working template for other British Columbia coastal communities. It is also notable that the Marr Creek component of the District’s Shoreline Protection Plan is one of three case studies reviewed by the Stewardship Centre at SFU, with funding from the National Research Council of Canada, as a working demonstration of “soft shore” adaption and mitigation of the future impacts of sea level rise on urban shorelines. Physical progress on projects within the approved SPP has been slowed in 2012 due to changes in staffing resources at both the DWV and DFO. This has resulted in unexpected delays in coming to agreements on the DFO "authorization" agreement for the long term Shoreline Protection Plan, and the movement towards an integrated model for an overall Shoreline Management approach with enhanced and higher level communications and discussion going forward between DWV and DFO. As of January 2013 a final draft of a DFO authorization has been tabled with validity to 2018 comprising the list sites and works described in the SPP. Activity by DWV is expected to commence in January to deliver boulders to the staging constructed staging ramp at the foot of 24th Street. These will be used to provide a boulder garden fronting the seawall for the Marr Creek component project described in detail in the SPP document. As an aside, Dec 17th, 2012 saw considerable storm and tidal impacts due to convergence of unusually high water together with strong winds and waves. 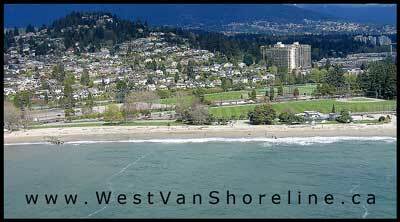 The flooding and overtopping of many areas along the West Vancouver shore highlighted the fact that much of the shoreline consists of low lying flood plain created by creek deposits, which has since been developed into residential and parkland facilities. The buffering and damage reduction provided by the soft shoreline features which continue to develop through the SPP were apparent. The soft engineering of the water's edge trail from Lawson Park to 15th Street was readily re-worked after the storm. Accretion rather than erosion of the beach was apparent once storm-tossed log debris was addressed. This event was a demonstration of future expected impacts of climate change. The role of a broad natural shoreline and reefs in providing resilient storm wave buffers will help mitigate increasingly frequent similar events as sea levels rise going forward. The following list is extracted from the SPP draft authorization, which is to be valid Jan 15, 2013 to Feb 28, 2018 – five years. Completion of this agreement will enable incremental work to proceed without further regulatory overhead, as budgeted and supplementary sourced funds, resources, and opportunities become available. Ambleside Pier 180 m2 of shallow sub-tidal boulder and cobble/gravel beach due to construction of a drift sill. Lawson Pier 275 m2 of intertidal boulder and cobble/gravel beach due to expansion of a drift sill. Lawson Park 1,000 m2 of intertidal boulder and cobble/gravel beach due to construction of three tombolos. 18th Street 750 m2 of intertidal boulder and cobble/gravel beach due to infill of foreshore and not more than 940 m2 of intertidal boulder and cobble/gravel beach due to construction of 3 tombolos. Dundarave Pier/Marr Creek 500 m2 of shallow subtidal benthic boulder, cobble and sand due to construction of 2 drift sills. Marr Creek Channel 400 m2 of cobble beach due to the placement of boulders on the intertidal foreshore. Dundarave Pier East 1,300 m2 of subtidal sand habitat due to construction of a low intertidal reef. Dundarave Pier East 1,100 m2 of cobble, sand and bedrock beach due to intermittent placement of boulders in front of the seawall. Dundarave Pier East 1,500 m2 of cobble and boulder beach due to construction of 2 tombolos. Navvy Jack Point 3,000 m2 of subtidal benthic boulder and sand due to the construction of a subtidal reef. Navvy Jack Point to Dundarave 9,990 m2 of subtidal benthic sand habitat due to construction of an offshore reef. 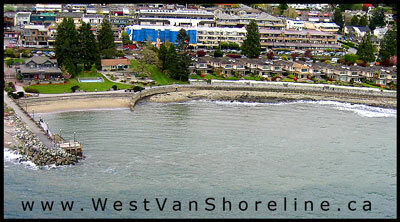 Two meetings of the Directors of the West Vancouver Shoreline Preservation Society took place in this period. The latter meeting was to receive information regarding the potential for increased large tanker traffic entering Vancouver Port to serve current proposals for pipeline export terminal activities. The Council Meeting of Feb 20th endorsed the ongoing "Shoreline Preservation Plan for 2012-2015" (SPP-2012). 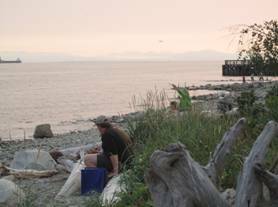 The West Vancouver Shoreline Society along with Stream-Keepers was closely involved in working with DWV staff and consultants to review the updated plan, and was gratified to witness the formal announcement, endorsement, and funding. WVSPS continued efforts to facilitate cash and in-kind donations from other sources and jurisdictions to partner with WVSPS and DWV going forward. A high priority is placed on identifying and engaging opportunities for donations of suitable reef building materials such as field boulders from excavations that might be re-directed for community benefit from otherwise going to waste. The ability to respond quickly to such in-kind "material" opportunities requires planning and support from federal gov't agencies such as DFO, Environment Canada, and Transport Canada. The updated SPP for 2012-2015 can be seen on the DWV web site (Click here). Project works outlined in the SPP work plan are planned for the coming months, as contained in the approved document work plan. Sites involved include Navvy Jack Reef, Marr Creek at Dundarave Pier, Lawson Creek and Ambleside Pier. Ongoing meetings are being held with federal agencies to seek their support and encouragement. DWV has appointed Mr. Ian Haras to administer the SPP going forward. Consideration is being given to an accountable and dedicated DWV position to knowledgeably and proactively manage the many waterfront issues and develop a higher level Shoreline Management Protocol encompassing the SPP, natural shoreline and protection, management of waterfront leases and DWV marine structures, and facilities such as the public piers and the boat ramp. In November 2011 the project work focused on establishing a sub-tidal reef footprint fronting the rip-rap rock armoured shoreline west of Navvy Jack Point. As outlined in previous plans, the reef is multi-functional: to provide stable kelp substrate, to mitigate ongoing erosion of the sub-tidal and intertidal zones fronting the seawalk infrastructure and, over time, to gradually allow for the natural accretion of an intertidal beach salient. It has been recognized since the Waterfront Directions Study 1991 that the best protection for this shoreline would be a naturally wide beach. Without recovery of a natural beach profile the long term costs of sea level rise induced storm damage are likely to gradually worsen, requiring major works and repairs. October to November, 2011 saw the compilation of monitoring assessments, surveys, and documentation analysis of the various project sites as a key component of the Shoreline Preservation Plan (SPP) work plans. The SPP work plan is updated annually but re-affirmed and committed in a formal process on a three year cycle. Monitoring is vital to learning and tweaking approaches and designs for the most productive, protective, and economic outcomes, and also as a working example to other jurisdictions of an incremental adaptive response to climate change impacts to urban shores. The various pilot project sites continue their evolution as they are worked by waves, biology and sediment inputs from the creeks. Habitat marshes and riparian vegetation zones are continuing to develop and are flourishing at numerous pilot project sites. Several privately funded, municipally managed projects have been enabled as a result of the success of the pilot project examples including residential frontage, street end parks and Horseshoe Bay park. Work in 2011 has largely involved tweaking of existing pilot projects and private / public projects at various locations. In particular, the kelp habitat reef at Ambleside pier received additional boulders and has developed a substantial kelp forest due to the stability of the rock holdfasts. The adjacent sand/cobble beach area has become more stable as it has taken on a more flatter profile that breaks storm waves over a wider surf zone as contrasted to the prior groin captured beach that was often over-steepened by fill/erosion cycles. The broad flatter upper beach profile is now more storm resistant. The beach was successfully assessed for the presence of surf smelt spawn by volunteers and schools. The boat ramp is again functioning with better low tide access. Sandy cobble that had in-filled the ramp was transported and placed to enhance the upper foreshore at various locations last year. Rock rip rap that was lowered to restore the reflected sea views across the infinity edge fountain pools at the 14th Street pier was placed into the kelp reef. The reworked armour rock bench has provided both improved aesthetics as well as the opportunity to plan for natural planting of this previously sterile riparian fringe. The beach fronting the 15th St. park continues to widen and shape to the point were much of the prior armour rock and the concrete seawall has become redundant. Some of this rock was again relocated to create offshore kelp reefs. As the more stable beach profile matures there is a noticeable increase in upper beach vegetation and expectations of successful conditions for smelt and sand lance spawning. From 15th westward the reef and tombola induced accretion and stabilization of the foreshore both supports and merges into the upper beach trail that was placed in 2010. The trail is intended to be an integral walkable part of the foreshore that provides both for a defined access corridor as well as a storm resistant backshore. Large driftwood debris is embedded in the upper beach to provide storm protection as well as nutrients and shading characteristics. The natural appearance of the driftwood beach has replaced the previous cobble armour and seawall characteristics. Additional round field boulders were placed in the intertidal and subtidal zones at strategic locations to enhance tombola and reef formations fronting Lawson Park. The development of a crenelated, crescent shaped upper foreshore has provided both increased human enjoyment as well as more extensive and viable spawning conditions for surf smelt. Again school students and other volunteers have documented the increasing productivity of these areas. At this time in September 2011 there has been a temporary placement of a large quantity of round field boulders adjacent to Lawson Pier that became available to the District at no cost. This temporary stockpile will be subsequently moved into kelp reef formations off the mouth of Lawson Creek that will further stabilize this very successfully recovering estuarine creek outlet. Boulders from the same donation were also placed along the last remaining vertical concrete seawall at 21st street. This has created a riparian berm that has been planted with dune grass. The porous nature of the boulders will soften the erosional seawall wave reflections and should lead to gradual widening and flattening of this zone over the coming years. The material was placed very quickly and the intent is to fine tune this area for best performance in conjunction with future work activity in the area. Plans to provide kelp reef and tombola formations at Navvy Jack Point have been slow in realization. Biological and coastal engineering assessment, design and approvals have been put in place... Implementation awaits funds, rock supplies and appropriate seasonal tidal cycles. The pilot placement of boulders around the sandstone pinnacle have populated with kelp and molluscs and seem to be attracting increased seabirds to the area. Plans for similar works at the east end of the Dundarave, Marr Creek seawall zone are also pending subject to resources. The WVSPS would like to thank Mr. Stephen Jenkins as he leaves his position with the municipality to pursue new career challenges. His energy and engagement have been critical to the successes since the Shoreline Planning Framework (2005) and the formally adopted Shoreline Protection Plan (2009) were tabled. The Directors of the WVSPS look forward to carrying forward the fresh awareness and momentum that has been achieved by working with staff and council (and Nature) to protect and enhance the Waterfront Community Shoreline. The various pilot project sites continued to develop as they were worked by waves and storms and received steady inputs of sediment from the creeks. Three small kelp reefs were co-funded by the WVSPS and the Coho Society at sites adjacent to the Lawson Creek Pier and the 14th Ave Pier during the spring. These developed very quickly and were soon visibly developing kelp gardens. The District of West Vancouver supervised the work. 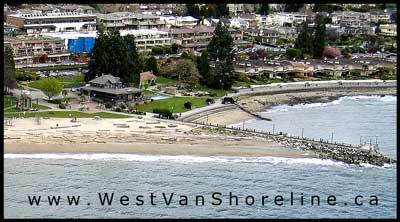 Based on the demonstrated successes of previous pilot projects and action items in West Vancouver’s Shoreline Protection Plan the District further tweaked some of the reef/tombola formations installed between the 15th Street Park and Lawson Park in late 2009. Several smaller inter-tidal boulder reefs were placed. In May the District announced a multi faceted overall initiative and plan for the Ambleside on-shore waterfront park areas and buildings.An enabling component of this larger plan is the enhanced and widened beach allowing for a naturalized shore side gravel pathway complete with vegetation and beach logs. In July the Surf Smelt Spawning Research Project initiated by the WVSP Society, with volunteers from HSBC Bank Canada, examining six beach areas discovered significant smelt eggs in the upper beach at Lawson Creek. It is hoped the wider and more stable expanse of upper foreshore sands and cobble will expand the spawning areas for smelt. Beach logs and shading will ensure the increasing survival of these vital forage fish which are an important part of the food chain for salmon on upwards to orcas and eagles. There has also been a noticeable increase in aquatic birdlife along the foreshore as they discover increasing sources of food in the barnacles, mussels, and kelp that are developing. Work was anticipated in the autumn months on a pilot project to further develop a sub-tidal reef and mid-tide islet/tombola near Navvy Jack Point as described last year The aim was to bring to this highly impacted and eroding armoured rip rap stretch of shoreline a working model of restorative natural biodiversity and productivity through the reef enhancement and subsequent natural development of an intertidal tombola over time. This project at Navvy Jack Point was a high priority of the Shoreline Preservation Plan and was implemented as soon as sponsors were obtained. Work was also proposed adjacent to the Marr Creek seawall, 25th Street, as funding permits. While no additional work was done at MacDonald Creek, 18th street , in the last two years it became very noticeable that the entire shoreline from MacDonald to the14th street pier had a much fuller upper foreshore with increased sand width and increased diversity. In short a healthier shoreline with a wider upper foreshore that over time became increasingly resistant to storm induced erosion and future impacts of climate change. Work included: restoring functionality to the boat ramp by excavating sand and cobble infill. This beach cobble was utilized to feed updrift beaches and accelerate erosion restoration and foreshore enhancement at Lawson Park , 15th St. Park and at Evergreen Place .One outcome of this work is that the small moorage float at the 14th St. Pier now has more water depth at all tides. The rock armour and rip-rap at 14th street was re-worked to provide increased intertidal benches that will now develop plant growth. This will enhance habitat values and improve the visual appearance by stepping and “greening” the blasted rock. Some surplus armour rock was removed and placed into a sub-tidal reef alongside the pier which has already developed a significant colonization of mussels and kelp. This reef area is also stabilizing a flatter beach profile west of the pier that is more resistant to storm wave erosion and contains a higher percentage of sand content in the upper reaches that is suitable for both smelt spawning and human beach “habitat” in summer. In one area the removal of excess armour rock has restored the original aesthetic intent of the water fountain pools at the pier by providing an “infinite – edge” appearance to the reflecting pool as originally intended. The broken concrete culvert pipes at 15th street were removed and small boulders placed to create a more natural appearing foreshore with a fresh water flow regime that is expected to foster continued mussel colonies. The rocks were placed in such a way as to trip breaking waves thus enhancing the width and stability of the upper foreshore fronting the park. Over time it may indeed be possible to remove the existing concrete seawalls as protection will be provided by a natural wider foreshore zone. At Lawson Park the two intertidal reefs placed last year were ‘tuned’ to improve the resulting wave refraction and breaking patterns that are fostering development of a curved crenellate shape to the beach east of the pier with increased habitat diversity as well as a wider upper foreshore zone fronting Lawson Park. The gap through the Lawson pier now feeds sediment to this downstream shoreline. The opening was improved to allow for storm passage of sediments rather than erosion and loss of materials to deep water at the pier tip. A few boulders were also placed in the existing boulder garden at the pier tip to ensure this upper beach sediment pathway is dominant and that the beach has a flatter, more storm erosion-resistant profile. The eroded beach east of Lawson pier was “perched” with the placement of an intertidal rock shelf that is presently filling in naturally with the sand and cobbles passed through the pier. The result will be a much improved beach for Lawson Park on both sides of the pier and permanent resistance to historic down-drift erosion east of the pier. The boulders and reefs at the mouth of Lawson Creek were ‘tuned’. In addition the gravel shore walk was shifted 30 ft landward of the foreshore and the riparian zone planted and protected with placed logs and boulders. Related shoreline enhancement works were conducted using the principles learned from these pilot sites at several private and public locations along the waterfront west of 25th street . Remediation work at Horseshoe Bay funded primarily by B.C. Ferries has significantly improved foreshore habitat in the Bay..
A meeting with Mr. Chris Badger and senior staff at Port Metro Vancouver, Steve Jenkins, Environmental Coordinator for the District of West Vancouver and several directors of the WVSPS was held at the Port’s office. Potential opportunities and linkages between the goals of the District of West Vancouver Shoreline Preservation Plan (SPP) and the Port’s goals and policies in the areas of of community engagement and environmental sustainability were discussed. The meeting was very positive and future discussions and actions are expected to follow. In the coming months work at Lawson and McDonald area will be finalized including planting of foreshore plants and details of sand bypass at Lawson Pier. Work is underway to apply the principles learned in recovering erosion fronting seawalls to an eroded area of private and public waterfront just east of Cypress Creek. Carefully placed intertidal boulder groups will trip storm waves, thus creating a broader surf zone that in turn enables stability and recovery of a flatter shoreline slope. The proposed pilot project at Navvy Jack Point that has been a high priority of the Shoreline Preservation Plan is proposed to be implemented as soon as possible subject to available budgets or sponsored contributions. The work involves placement of offshore subtidal reefs and mid tide islet / tombola formations. Initial planning examination of the area just east of the Ambleside Pier, (another proposed SPP project) is also being considered to improve the quality of the shoreline while improving the safety of boat launching and access. Over the summer months work was done to "tweak" the enhancement works between Lawson Parkand McDonald Creek. At McDonald Creek in particular the beach elevation now has been raised to eliminate the scouring drop and this may in future allow for possible fish passage into the creek itself. At Lawson Creek, with the shoreline stabilized at the location of the culvert and legacy seawall it has enabled installation of a log footbridge. The footbridge was funded by a West Vancouver Foundation legacy donation by former Mayor Don Lanskail for the purposes of contiguous public access to the shore. Work was done to enhance the storm wave passage of upper beach material through the Lawson Pier and a small tombola boulder feature was placed just east of the pier to encourage a wider and foreshore sandier upper foreshore and provide for kelp attachment and stability in the mid tidal area. Based on the District's successes with the pilot projects, four private property owners at 27th Avenue have recently funded the District to enable shoreline enhancement and rehabilitation work that benefits both the public park at the road end as well as well as enhancing the public shores fronting and protecting their individual properties. The linking of multiple private properties very much supports the coastal unit approach to restoring the overall health of this stretch of seawall impacted shoreline and their leadership is a very empowering example. The District is in discussion with other waterfront property owners who also appear interested in contributing to shoreline health as a pre-emptive response to climate change impacts of increased storminess and sea level rise. The District and WVSPS goal of re-creating a kelp forest and intertidal reef and tombola in proximity to Navvy Jack point are a high priority and efforts continue to find funding or in kind opportunities to advance this component of the overall Shoreline Protection Plan. A modest input of sediment from the creeks over the winter and limited storm wave events has allowed the shoreline to evolve gradually. 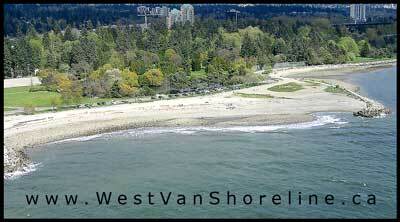 Noticeable gains in beach width and upper beach sand retention has been noted from McDonald Creek to Ambleside Pier. Expanded kelps, mussel beds and other habitat features are prolific as of May 1st. Aquatic birds are prolific amongst some of the new reefs and bull kelp beds. Private/public foreshore enhancement projects building on the principles of the pilots and the Shoreline Protection Plan (SPP) are continuing to develop. One private property owner has elected to remove a legacy concrete and glass panel seawall in favour of a naturalized shoreline. Adjacent waterfront property owners are now expressing interest in extending the naturalized approach. Incremental enhancement work is planned in spring and fall of 2008 along the public foreshore as per the SPP within the limitations of the municipal budget. It is hoped to implement a LIDAR survey of the foreshore in 2008 to provide an accurate benchmark for both anticipated impacts of climate change impacts and the mitigating benefits of the foreshore pilots. The 2007 pilot sites undergo rapid biological colonization. Shoreline profiles continue to evolve as the increased supply from McDonald and Lawson Creeks is worked by wave and tide. Monitoring surveys measure the before and after shoreline attributes. Habitat diversity and quantity are found to have increased by 150%. The foreshore between McDonald Creek and 13th Ave Pier is responding to enhanced sediment transport. In particular the upper beach zones appear to have responded by developing a wider band of upper beach sand and cobble. With the arrival of winter rainfall and creek discharges it is expected that further sediment inputs and stabilization will continue to enhance shoreline values over the winter months. Detailing work is completed on May low tides to all six pilot project sites. Sites are developing biologically and physically. The spring of 2007 has received a lower degree of large wave events than average for this time of year. The District Parks and Recreation Branch has removed visual and physical barriers and placed gravel pathways to provide for public overview of the shore at several locations between Lawson Park to 15th St.
A staff report to Council provides an update at the Council meeting of June 18th. Council members are unanimous in affirming positive support for work done and work to be done. District staff continues to work on the longer term shoreplan. Work is proposed to provide sub- tidal and inter tidal rock placement at Ambleside Beach and Navvy Jack point. This work will be subject to tidal opportunities and availability of resources both financial and in-kind. WVSPS applies for Federal Government Environmental Damages Funding to support a discrete subtidal habitat and kelp enhancement pilot project. WSVPS and Streamkeeper volunteers with engineering and forestry expertise meet with District Staff to discuss the importance of improving base flow regulation of water and sediment flows to the shoreline including design constraints imposed by the existing diversion and debris basin structures in the upper reaches of McDonald Creek. Continuing storm and rainfall events. The pilots appear to be functioning as expected in limiting erosional losses. The projects are planned to be completed when daytime low tides allow access in February and March. Intense rain storms test the recent pilot projects and bring large volumes of sand and cobbles down the creek beds. The pilot projects appear to be achieving the goal of restoring sediment discharge paths and retention on the upper foreshore that more closely emulates the creek mouth prior to the box culvert constraint. With collaboration of the District of West Vancouver and funding commitment provided by the WVSPS, the Canadian Hydrographic Service is able to perform a high resolution near shore hydrographic survey along the Ambleside waterfront. By doing the survey on a very high tide it will be possible to link these aerial topographic surveys of the beach on extreme low tides that could be done by the District the next time they contract for aerial topographic work to be done. This detailed survey will provide immediately useful improved understandings of the shoreline but also provides a highly accurate benchmark to evaluate long term process over time. Pilot projects at Lawson Creek to McDonald Creek are underway. Work is implemented around the tidal opportunities provided. The work at Lawson Creek is intended to provide improved features at the creek mouth to mitigate the historic box culvert and vertical seawall at the creek’s mouth. The soft modifications and placement of field boulders in the inter tidal areas are expected to enhance biological diversity, reduce erosion loss from the foreshore of sand and cobble beach materials and enhance the long term public appreciation and enjoyment of this shoreline feature. 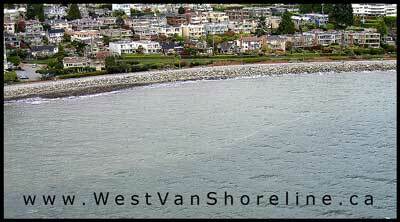 Neighbouring property owner indicated interest in following the solutions developed for adjacent seawall property. Pilot principles being developed for public waterfront are suggested for private property owners contemplating seawall repairs. 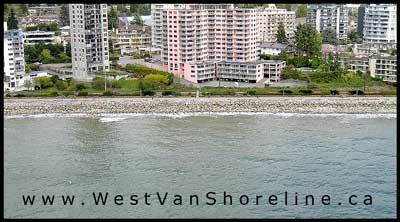 Owners work with the District of West Vancouver to implement soft shoreline protection in place of concrete seawalls at less expense. 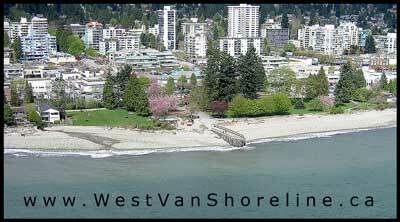 District of West Vancouver announces adoption of foreshore initiative and endorses implementation of initial three year action plan to 2008.